Solapur Municipal Corporation (SMC) has launched an online GIS property tax payment portal for its citizens, as a part of the property tax digitalization initiative. The portal is based on CyberTech's GeoCivic® platform, India's only cloud-based platform for property tax digitalization. This move is aimed at providing a hassle-free option for citizens of Solapur to pay and view property tax details. Additionally, SMC officials will gain valuable insights on property tax collection throughout the city of Solapur. On the launch of this online property tax collection portal, SMC Commissioner, Dr. Avinash Dhakane said, "GeoCivic® has simplified the process in order to smoothen tax deposit. This is one of the steps taken towards transitioning Solapur as a smart city." This implementation was assisted by Mr. Sachin Kamble, Nodal officer. Currently this facility is deployed for few regions in Solapur and will be extended to the entire city of Solapur within a span of eight days. GeoCivic® Property Tax Digitalization platform is a proven technology to geo-enable and automate ULB's (Urban Local Bodies) entire process of property tax assessment, collection and management. Major states and cities in India are leveraging GeoCivic® platform to digitalize their property tax data and workflow, and will be a part of GeoCivic®'s success stories in the recent future. About CyberTech Systems and Software Ltd.
CyberTech Systems and Software Ltd. is the leader in Next-generation Spatial and Location Analytics. CyberTech's Spatial Analytics products GeoShield, GeoCivic®, CyberServe and GeoServe cater to broad vertical markets. For more information, past results or conference call transcripts, please visit our website http://www.cybertech.com. CyberTech demonstrated the leadership in the area of risk alert services with real-life examples. The audience got a complete picture of how Risk Alert services helped all of its clients during critical situations like Chennai floods, Vardah Cyclone. The idea of Risk Alert services was an eye opener for attendees. 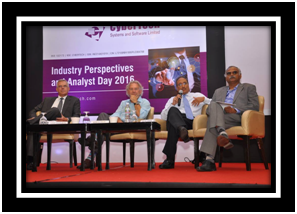 Attendees were surprised by comprehensiveness, coverage and Real Time Alerts of various incidences. It has attracted tremendous response towards our offering. Positive word of mouth from existing clients also added more creditability to our product offering. CyberTech also had the honor of sponsoring this event that was organized by Continuity and Resilience (CORE). CyberTech Announces Appointment Of Two New Members To Advisory Board. CyberTech Systems and Software, The Leader in Enterprise Spatial and location analytics, has announced the addition of two new members, Mr. Faiyaz Shahpurwala and Mr. Chris White, to the Advisory Board. Mr. Shahpurwala is a global technology leader who operates with a start-up mentality; focused on building strong teams that are centered on a culture of innovation, with a record of creating, building and leading multiple services and product organizations. . He is extremely skilled in driving ideas from inception through growth to conventional commercial enterprises that contribute to the top and bottom seam. Throughout his 13 years tenure at Cisco, Mr. Shahpurwala managed a wide range of responsibilities at leadership level. He headed the creation, development and implementation of Cisco’s Global Intercloud infrastructure, and built a team from zero to 600+ over two years. He accomplished 60% revenue growth in the two years leading Cisco’s Global Intercloud Infrastructure. Mr. Shahpurwala is the inventor and patent holder of NatKit, a remote network monitoring tool. He is also on the board of several foundations. Mr. Shahpurwala holds a Master’s Degree in Computer Engineering from Western Michigan University. As a Member of the Advisory Board, Mr. Shahpurwala will help CyberTech in transforming the platform architecture to support the non-linear growth of the company. Mr. White is a transformational global sales and operations leader in the area of Digital Transformation and IoT. He is an expert in igniting high-growth businesses and transforming start-ups to multi-billion dollar global enterprises. He is a well-known industry spokesperson and has been distinguished as a digital transformation leader with forums like TEDx, NASCIO, IoT World Forum, etc. In 20+ year tenure Mr. White has a transformational leadership track record, driving success within Cisco and 2 startups. He worked with Cisco Systems in various executive leadership positions and currently heads Cisco’s IoT Sales, Strategy and GTM. He created largest IoT solutions portfolio engine in the world, generating a $3B impact, growing at 50% Y-o-Y, with estimated business impact of $19T of economic value. He is also the Co-founder of Cisco’s Smart Grid, which evolved into IoT, with No. 1 position in the markets globally. 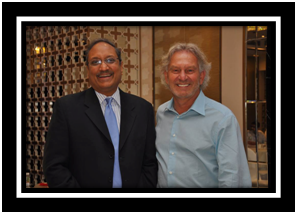 In 2013, Mr. White received the British American Business Award for Business Excellence. He is also part of Ingram Micro’s IoT Strategy Advisory Board. Mr. White holds B.A. (Honors) in Business from the Kingston College of University of London. As a Member of the Advisory Board, Mr. White will help CyberTech in Channel Sales Model development to achieve non-linear growth. CyberTech is a CMMI Level 3 Next-generation Location analytics and transformative geospatial solutions provider. CyberTech's Map-analytics based digitization products GeoShield, GeoCivic, CyberServe and GeoServe cater to broad vertical markets. 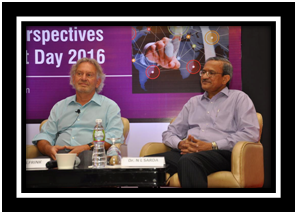 Images from the meet with Wim Elfrink and Dr. N. L. Sarda as special guests: Industry Perspectives and Analyst Day 2016— at The St. Regis Mumbai. 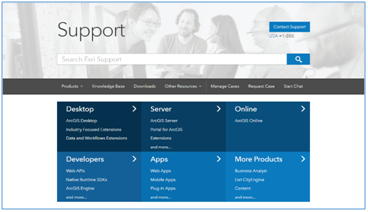 Sitecore based Esri support website built by CyberTech is rated amongst top support websites. Esri is market leader in GIS with large numbers of products, which caters to 50+ industries and are distributed by 80+international distributors & 2000+ partners. The new support website empowers Esri to realize its vision oftransforming the legacy support website to an attractive and informative portal. 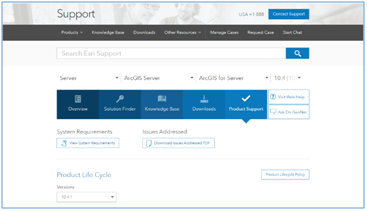 The new responsive websiteenhances the user experience, effectively aligns with Esri product line and support processes while reducingthe support cost and call volume. The complex architecture of the site includes integrations withSalesforce Service Cloud, SGA, KBuilder, Interactive Chat, Product Catalog, just to name a few. In addition to core Sitecore architects and developers, a strong team of BAs, UI/UX experts, integration experts,automation and testing specialists teamed up to complete the site in less than 14 weeks. A rainfall that seemed minor and harmless in the early hours of 9th November, 2015 later brought Chennai on its knees, hard-hit with the worst flood in the century. The devastation caused included, Loss of human lives, Property & infrastructural damage, Dysfunctional public transportation, prolonged power outages, broken communication lines, Non-functional financial centers. Organizations operating in Chennai faced multi-level concerns during this time. Some of the primary challenges were safety of employees, security of key assets on ground, continuity of key business activities, business losses and more. CyberTech’s Risk Center provided timely alerts & advisories for various incidents during this difficult time to its partners. It generated the meteorological advisory at 02.03 PM on 6th November even before the media sources. Risk Center further got the confirmation on the formation of depression and updated it on November 8th to its partners. It kept its relentless focus on the incident and generated 47 alerts till 7th December, 2015 which enabled partners to take timely business decisions. Dharmendra Kava, Vice President, Business Continuity Planning, Yes Bank also commented “Based on the advisories and alerts generated by CyberTech for Chennai floods and employees feedback, Bank was able to take timely decision of closing branches that were severely impacted by floods and increasing strength at branches which were less impacted, reducing the impact on business and ensuring safety of staff”. Vishal Bargat, Sr Vice President and Head-INDIA BU, CyberTech commented, ‘We are glad that our timely alerts for risk visibility solutions helped our clients including Infosys and Yes Bank for timely planning against incidents, thereby ensuring business continuity and safety of their employees & key assets during Chennai floods, we look forward to support our partners in future also”. 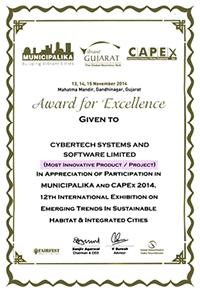 Mumbai, Maharashtra - 17th November, 2014 - Thane-based GIS firm CyberTech reaffirmed its leadership in building next generation, geo-enabled governance solutions by bagging the ‘Most Innovative Product’ award for GeoCivic® – its GIS based integrated product suite, at the ‘Municipalika 2014 – 12th International Conference on Emerging Trends in Sustainable Habitat & Integrated Cities’. The selection committee acknowledged the various modules of Geocivic® as highly useful applications, tailor-made to meet the objectives of the various functions of Indian Cities. GeoCivic®, CyberTech’s flagship GIS-based application suite, is designed specifically to provide Indian Municipal Cities with an integrated Spatial Decision Support Engine. The product helps Government officials leverage locational intelligence to drive their mission-critical objectives, thus ensuring optimum and effective governance. CyberTech was one of the key exhibitors at the conference, held at Mahatma Mandir, Gandhinagar, and Gujarat from 13th to 15th November 2014. 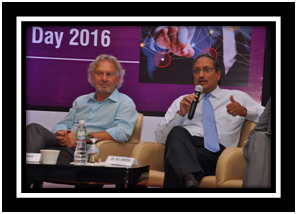 One of the key sessions at the conference was delivered by Mr. Vishal Bargat, Sr. Vice President & India BU Head, CyberTech. The much appreciated session elaborated the need for innovative technology solutions to build smarter and more efficient cities. It also gave a good glimpse of how Governments can use GeoCivic® flavors which includes Property Tax Management, Road Infrastructure Management, Public Health Management, Public Safety and Disaster Management, Solid Waste Management and Citizen Complaint Redressal to build a seamless information infrastructure for optimum and effective planning and development. The selection committee appreciated the various modules and functions that build the technology backbone to enable smart city performance. The ‘GeoCivic® - Smart City Governance’ booth attracted a sizeable foot fall at the conference, with many noted Government dignitaries showing keen interest in the live product demos exhibited by senior CyberTech consultants and domain experts. The presentation and demos showcased key GeoCivic® applications that can benefit a wide range of users including local and state governments, public safety organizations and citizens. The conference, inaugurated by Gujarat Chief Minister, Honorable Shrimati Anandiben Patel, saw huge participation from several Municipal Commissioners and eminent Government dignitaries from across the country, including Honorable Shri Shankar Aggarwal (IAS), Secretary to the Government of India, Ministry of Urban development, Honorable Shrimati Anita Agnihotri, Secretary to the Government of India, Ministry of Housing & Urban Poverty Alleviation etc. The conference highlighted the challenges of Indian Government organizations with several enlightening discussions on the way forward to efficient and smart governance for Indian cities. “India is urbanizing very rapidly thereby, increasing the aspirations and needs of the citizens. Rapid urbanization creates many challenges for governments, while governments are struggling to do more with the less. This is the time when government should focus on expansion of technology and its adaption through application centric infrastructure. Smart solution like GeoCivic® can help governments to address challenges in city infrastructure management and help them to achieve smart governance for smart citizens thereby building a smart city” Vishal Bargat, who has been product owner GeoCivic® at CyberTech. 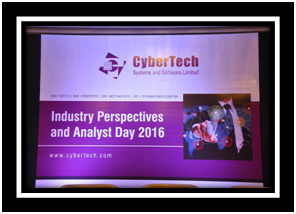 CyberTech, an Esri Gold Business Partner, listed on both BSE and NSE, has several offices across India and the U.S. The company has been building cutting edge, next generation GIS solutions for nearly two decades. Supported by a sizeable strength of more than 250 specialists in latest Esri technologies (world leader in GIS technologies), the company has numerous transformational projects to its credit including several success stories from India alone. Many large Indian city governments such as Mumbai, Bangalore, Thane, Pune, Amravati etc., along with quite a few State-level Governments including Karnataka and Andhra Pradesh, have already gone high-tech with GeoCivic®, with many other ongoing implementations at other cities such as Solapur. New Delhi, 19-20th September 2014 - CyberTech receives the “Skoch Order of Merit” in the 37th Skoch Summit on “Minimum Government, Maximum Governance” held at the India Habitat Centre, New Delhi on 19-20th September 2014. CyberTech has received this prestigious recognition as “India’s best governance projects 2014” for the excellent project conceptualized and delivered for the city of Bangalore. The project has been awarded this appreciation in two categories: ‘Smart Governance’ & ‘Advanced Technology’. The Skoch Digital Inclusion awards is a highly renowned and prestigious platform instituting India’s highest independent civilian honors in the field of Governance, Finance, Technology, Economics, and the Social Sector. CyberTech’s selection has come after a fierce competition among more than 1000 entries from across the country, including leading national and international IT and technology companies. CyberTech’s selection for this ‘Order of Merit’ speaks volumes for the customer acceptance and quality of its GeoCivic® solution. It is a reflection of the success that CyberTech has had at building market-driven solutions on leading Esri technologies. This achievement will not only help in creating a stronger GeoCivic® brand, but will also create better opportunities for CyberTech to reach out to its target market and deliver better value to its customers. Critical governance decisions being largely dependent on geographically disparate data, BBMP realized the importance of GIS for efficient information collection, management, and analysis. The city, having always been a promoter of advanced technology, was looking to leverage the best of GIS technology for its transformation initiative. Given this background, BBMP reached out to CyberTech Systems and Software Ltd., an Esri Gold Tier Partner headquartered in Trevose, Pennsylvania, with offices worldwide, including Thane West, Maharashtra, India. The company's long- standing partnership with Esri made the CyberTech-Esri combination the preferred choice for BBMP. It made sense to leverage the GeoCivic platform, CyberTech's ArcGIS software-based application suite that caters to the end-to-end needs of local governments in India, to drive the GIS transformation initiative. BBMP, on a regular basis, also had to manually manage the permissions and monitoring of road cutting activities carried out by various service providers (telecom, electricity, water supply, etc.) and by private property owners. The move to GeoCivic and the ArcGIS platform automated and streamlined the entire road cutting approval and management process. Through high- quality vector maps, the system now gives BBMP an integrated, spatial view of the proposed roadwork and helps officials approve, monitor, and maintain road cutting activities. Through advanced GIS and management information system reports, the system also helps users analyze pending projects and track them through completion, consequently enabling better-informed planning decisions. Mumbai, India – March 6, 2014 – CyberTech has partnered with NC4 Inc., a leader in revolutionizing safety and security, specifically to provide advanced risk visibility solutions to the Indian market. A key component of the alliance is the launch of the 24x7 “CyberTech Risk Center”. 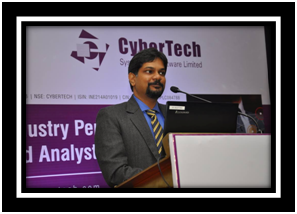 On Wednesday, 5th March 2014; CyberTech announced the national launch of ‘CyberTech Risk Center’ at Grand Hyatt Mumbai. Given the increasing amount of emergencies in India such as terror attacks, riots, strikes, and political protests, natural disasters etc., Indian organizations today, need to be better prepared to protect their businesses, assets, and employees. Utilizing CyberTech’s expertise in Geographical Information Systems and NC4’s risk management experience, the CyberTech Risk Center focuses on giving geo-coded, real time information of emergency incidents that are likely to impact Organizations in India. Through this initiative, CyberTech extends advanced, predictive risk mitigation solutions to the Indian market, thereby helping organizations get early warnings of potential business disruptions. This partnership thus represents synergies of CyberTech’s expertise in geospatial systems for the public safety & security sector, and NC4’s world leading risk management expertise. CyberTech is a leading provider of next-generation Geospatial, Networking, Enterprise IT, and Public Safety solutions. Leveraging its deep geospatial technology expertise and over two decades of experience in solving complex geospatial challenges across the globe, the company delivers an unmatched range of integrated geospatial solutions. CyberTech’s innovative, IP-based offerings guarantee consistent quality and deliver significant business value for a range of industries including government, education, utilities, public safety, technology, telecom, retail, healthcare and manufacturing. To learn more about CyberTech, please visit www.cybertech.com or call +91-22-2580-9362. NC4 provides revolutionary safety and security solutions that empower government and business with accurate, timely and secure information. NC4 solutions are used in the public sector by, federal, state and local agencies in both emergency management and law enforcement disciplines, and in the private sector by companies involved in financial services, high-tech, insurance, manufacturing, aerospace and defense, oil and gas, pharmaceuticals and healthcare, as well as several other industries. NC4 takes a comprehensive and integrated approach to safety and security by providing: relevant global security and travel intelligence, analysis, traveler tracking, and real-time threat alerting to mitigate risks; a common operating picture for fighting crime and managing emergencies; and a platform for secure communication and collaboration. For information about NC4, visit www.NC4worldwide.com or call toll-free, 1-877-624-4999.